Cibando is a new iOS and Android app from the company of the same name. The app is a completely free download from the App Store and Google Play. Location-aware restaurant finders appear to be a growing trend on mobile — just recently we saw the excellent Foodspotting, for example, which we reviewed here. It’s an eminently sensible use of location-aware mobile technology — between all the location-based services that are out there nowadays, there is the means of finding a wide variety of services, so it is a good idea for apps to start providing focused experiences rather than simply the fun but ultimately fairly pointless experience of “checking in” to places. The way Cibando works is that users draw a circle on a map around the location they would like to search, and the app then provides them with locations and information on restaurants in and immediately around that area. Each location displays its title and the type of establishment it is when tapped on, and all the search results may be viewed in list form by tapping a button in the corner of the screen. 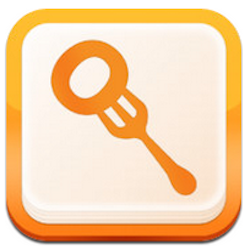 Search results may also be filtered by establishment type to aid with finding the type of food the user is looking for. Tapping again on a location brings up further information about it. This includes the address where available and any additional information that is available on the establishment. Users are able to suggest an average price for the location, too, though it is only possible to submit these suggestions in Euros, since the app originates from Italy and its international support is not great just yet — more on that in a moment. Users may also submit “tips” regarding the location, much like on Foursquare, and these are then added to a list under the location. This list is split into two parts — a chronological list, and a “suggested” list according to the most popular tips. Tips may be “liked” or commented on, and users may use either their Facebook or Twitter accounts to sign in and post. Tips may also supposedly be shared to social services, but when tested I got a message saying I had shared to Facebook too many times — this occurred the first time I attempted to submit a tip, so something is wrong somewhere. The big criticism that many App Store reviewers have leveled against Cibando is that its distant search function only allows users to jump to locations in France and Italy for some reason. This does not mean that there is no information on other locations — it found a variety of restaurants in the area immediately around my home in Southampton, U.K. without issue — simply that it is impossible to quickly navigate directly to a specific location anywhere other than France or Italy. Exactly why this feature has been implemented in this way is not clear at all, but it has led to widespread disappointment among App Store commenters who were hoping to use the app to plan where to eat on a visit to another location. Cibando is off to a reasonable start, and its current feature spot in the New and Noteworthy section of the App Store front page will certainly help it pick up some users in the short term, but it needs some significant work. It needs worldwide search support, for starters, and whatever is wrong with the social connectivity needs to be resolved, too, as this will likely form an important part of the app’s viral promotion strategy. The idea is sound, however — the execution just needs a bit of refinement before this can be recommended without hesitation. You can follow Cibando’s progress through the iOS and Android charts with AppData, our tracking service for mobile and social apps and developers.